First off, I want to preface this post with the fact that social media shouldn’t be done only with the goal of making direct conversions. Social media is about building new relationships, generating word of mouth marketing, and strengthening brand loyalty with your customers. That said, I know that there are a lot of you who may be curious about the monetary value of your social media campaign, have clients that are asking the value of the social media services you provide for them, or simply want to learn more about how your social media strategy is leading to conversions. Track goal conversions for your website in Google Analytics, a plus regardless of whether you care about social media conversions or not. Analyze just the social media referral traffic for your website in a customized segment which will help you know the effectiveness of your social media strategy. See the correlation between your social media referral traffic and goal conversions on your website so you can associate a monetary value to your social media campaign. The Google Analytics you have grown to love is changing with the new version. You can see this version by clicking on the New Version link in the top right of your Google Analytics dashboard. Since the new version is closing in, I thought I would cover the new setup features of your Google Analytics for social media ROI measurement. Before you can do any kind of measuring in terms of your social media success, you will need to setup your goals in Google Analytics. The signal of a completed goal in Google Analytics can be anything including when someone lands on a specific page of your website, when someone spends a certain amount of time on your site or browses a certain number of pages, or when they click on a link to download a whitepaper or leave your site. When someone buys an item from your website. When someone clicks on an affiliate link to a product on another site. When someone subscribes to your newsletter. When someone downloads a free report from your site. When someone clicks on your Feedburner subscription link. When someone clicks on a link to your social profiles. To setup goals, go to your website’s analytics dashboard, and click on the Settings wheel icon to the right of the orange toolbar. From here, click on the Goals tab and click on + Goal to add a new goal. The following are the four goal types you have to choose from, and some sample ways to use them. If someone purchases an item, the Goal URL would be the “thank you for your order” or confirmation page. If someone signs up for your mailing list, the Goal URL would be the customized thank you page people are redirected to once they have submitted their email address. You should setup your Goal Value to be the average amount of the common conversion. So if your average sale amount is $30, enter 30, or if your average mailing list subscriber is valued at $5, enter 5. This goal type is achieved when someone spends a specified amount of hours, minutes, or seconds on your website. This one is a bit tough to associate with a Goal Value, but if you can estimate that people who have been on your site for over 15 minutes likely purchase an average of $15 in goods, then you can enter 15. This goal type is achieved when someone visits a specified amount of pages during one visit. Again, it is a tough one to associate with a Goal Value, but if you can estimate that people who visit more than 10 pages on their site likely purchase an average of $20 in goods, then you can enter 20. Have your Google Analytics installed before your </head> tag on your website. Add onClick=”_gaq.push([‘_trackEvent’, ‘Category’, ‘Action’, ‘Label’]);” to your event. 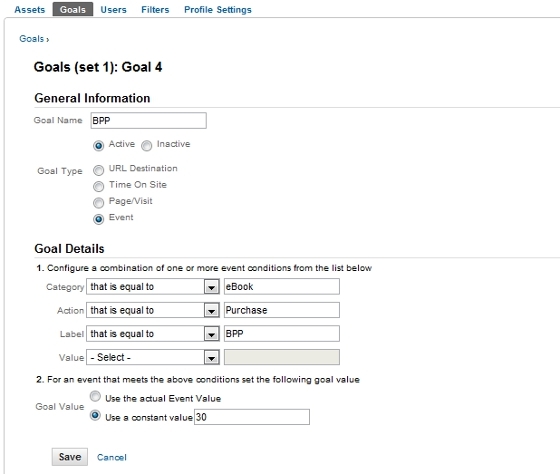 Configure the Goal Details to match your event tracking code. A completed goal using the event type. Note that the downside of tracking external events (like someone clicking on a link to go to another site to buy something) is that you are tracking visitors leaving your site, not making the purchase. So you might want to match up the number of goal conversions with the number of actual sales you make in a month and adjust the value of your goal to match accordingly. As a disclaimer, this is the most basic of goal setups in Google Analytics. You can do much more with event tracking including solutions specific to ecommerce sites. There are also goal funnels which can show you where people drop off during the conversion process on your own site to help you further optimize your sales process. Next, in order to see your goals in relation to your social media referrals, you will need to setup a custom advanced segment in Google Analytics as follows. Click on ADVANCED Segments , and to the right under Custom Segments , click on the button for + New Custom Segment. Name your new custom segment Social Media, and then start adding social media referral domains by clicking on the dropdown to the right of the Include and selecting Source. Leave the next dropdown on Containing and enter your first social network domain. To enter additional domains, click on the Add OR statement link. Setting up an advanced segment for social media referral tracking. The following is a key to the major social media referrers. You may want to lump them all under Social Media or break them down as follows between major social media networks and social bookmarking networks. facebook.com – This social network is currently the second most popular site in the world according to Alexa. twitter.com – Even if it’s not the most popular social network in the world, the most popular tweets generally have links which makes them a strong social media referral for most sites. stumbleupon.com – This network is right up there with Facebook as one of the highest traffic generating social media sites. plus.google.com – See referrals from Google’s new social network separate from search engine referrals. hootsuite.com – Management tool for Twitter, Facebook, LinkedIn, and several other social media networks. linkedin.com – Traffic from this network is especially powerful as it is the top social network for professionals. paper.li – Daily paper site which compiles tweets from various users in lists, by hashtag, and by following. Updates are primarily sent through Twitter. twitterfeed.com – Allows users to automatically tweet new RSS feed items to their users. Updates can be sent through Twitter, Facebook and other social networks. youtube.com – If you have videos, you should definitely consider adding your link to each of them as this is the third most popular site in the world, again according to Alexa. flickr.com – This one is a particular favorite if you are a photographer or host your images offsite. digg.com – While waning in popularity, Digg can still be a nice traffic generator if your content makes the homepage or your account has plenty of followers. delicious.com – Still a popular social bookmarking site despite the recent change of hands from Yahoo to the former owners of YouTube. reddit.com – This bookmarking network has grown in popularity since Digg reinvented their network last year, but still only caters to certain types of content. You may also want to go through your traffic referral sources list to see if there any other social networks which are more niche specific that you want to include in your social media custom segment. Click on the Preview Segment to ensure that your segment is pulling in the right data, and then click on Save Segment to save your changes. Whenever you want to view data specifically related to your social media referrals, you can do so by clicking on Advanced Segments , checking the box next to your custom Social Media segment, and clicking Apply. 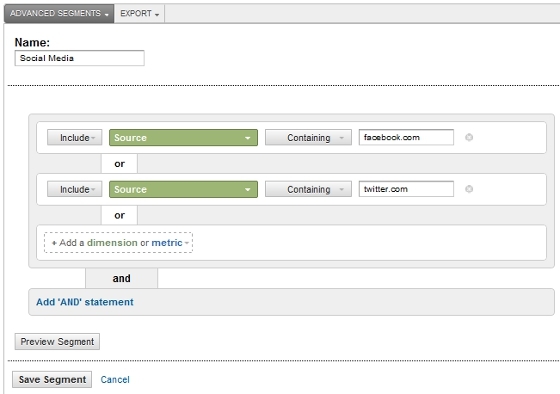 Now you can go through all of your Analytics looking at only Social Media related data including your conversions. Under Conversions > Goals > Overview, you can see the following from only the social media referrers you setup in your ADVANCED Segments . Overview of goal conversions from social media referral URLs. Percentage of your total goal completions. A graphical overview of your goal completions. 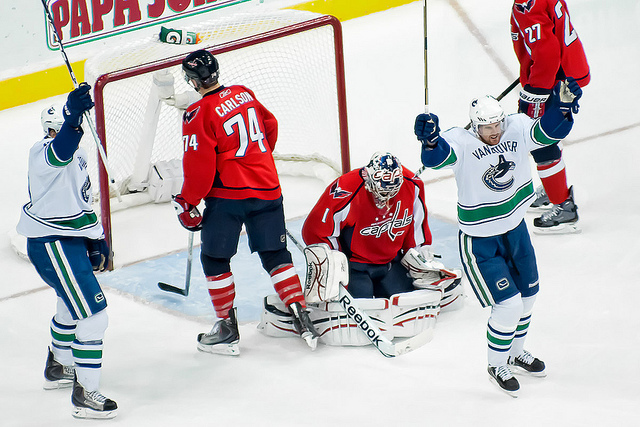 A summary of your total goal completions, total goal value, and goal conversion rate. Specific goal completion URLs which led to conversions. If you click on the Goal Option dropdown, you will be able to see and click on specific goals for their detailed metrics as well. View detailed metrics for each of your goals. The above screenshots are taken from my personal blog which does not offer a lot of products, and therefore has lower numbers. You can probably expect that any website which offers more conversion opportunities through products and services will have stronger social media referral numbers and higher goal values. Before we end this post, here are a few extra tips for those looking to increase social media conversions and track those conversions more effectively. If you’re not seeing the amount of conversions you were expected via social media, then you might want to look into better conversion optimization for your website. The following are some great articles and infographics on those lines. Are Third-Party Tools Conversion Killers – This post looks at how even the smallest script (such as the Google +1 button) could add a delay in page-load time leading to less conversions. How to Create Social Media Landing Pages – Get more conversions through social media using targeted landing pages. 7 Secrets of Social Media Conversion – A great infographic on the seven things you need to do to ensure a better social media conversion rate. For many businesses, one of the reasons this methodology doesn’t always work is because people may see a message from the business on a social network, but then their conversion is made within a physical store or on the phone. In these cases, you will want to have something that customers can reference, such as a customized discount code based on social network. So in your tweet, be sure to tell people to mention TWITTER20 for 20% off, and on a fan page update, tell them to mention FACEBOOK20 for 20% off. This way you can get a better idea of how many people are being referred to your stores and phone ordering systems via social media. How Do You Track Your Social Media Goal Conversions? Now that you know how I’ve started tracking social media goal conversions, now it’s your turn. 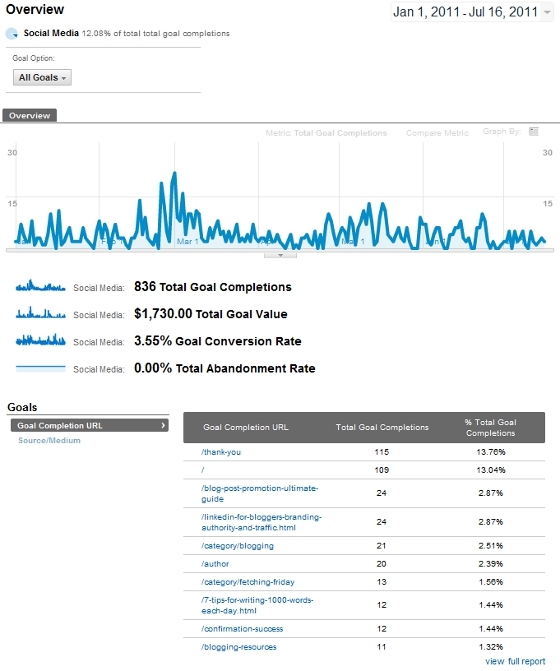 How do you track your social media referral traffic in relationship to your conversion goals? Have you found it an adequate way of explaining social media ROI to clients? Please share your thoughts and experiences in the comments below, and happy converting!